GENEVA, Ill. -- West Michigan WhiteCaps pitcher Luis A. Sanz is standing in the bullpen before a game, talking about a rough game he had the night before. Meanwhile, catcher Luis A. Sanz nods patiently, offering words of support and encouragement. "I've been in this game 18 years now and I've never seen it or heard of it," said WhiteCaps manager Joe DePastino. David Malamut One brother, Luis A. Sanz, is a pitcher and the other, Luis A. Sanz , is a catcher and both were named after their father, who also has the same name. Even the most dedicated fans of the Tigers' Single-A Midwest League affiliate are double-checking their scorecards these days. For in all of baseball history, there have been dozens of times when two brothers were teammates. And while there's been 16 batteries at the major league level composed of brothers -- the most recent Larry and Norm Sherry of the Dodgers in 1962 -- there's no record of one featuring two brothers with the same name. "I just call them Luis and both of them look," DePastino said with a laugh. "Their middle names are different, but on the lineup card I still have to put Luis Sanz down, but just with different numbers." Luis Angel, the pitching half of the duo, wears No. 44 while younger brother Luis Alberto, the catcher, wears No. 13. Luis Angel says both he and his brother were named for their father, who -- you guessed it -- also goes by Luis. With three men in the same house having the same first name, things could have been confusing growing up. But he says his mother had a way around that. "In the house, my mother called us by our middle names," he said. "It'd be Luis Angel or Luis Alberto, so it was no problem growing up because she knew our name." 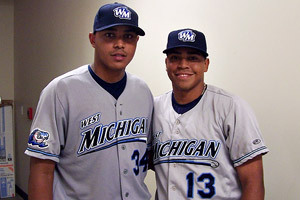 It's a pairing that happened only recently -- Luis Alberto had been demoted from High-A Lakeland to West Michigan in the middle of June. Two and a half weeks later, Luis Angel joined him on the squad after earning a promotion from short-season Connecticut. Both are aware of their rather unusual place in baseball history and while they're proud of it, to them playing together comes naturally. "It's the first time we're doing it here in the United States but we've been playing together for a long time back at home in Venezuela," Luis Alberto said. "We're just enjoying what we're doing right now." So far, they've comprised the same battery only once in a game, on July 5 in Grand Rapids in a 6-5 loss to the Dayton Dragons. Ironically enough, the game happened to fall on the same date as Venezuela's Independence Day. In that game, Luis Angel struggled on the hill, giving up five earned runs in 6 ⅔ innings and taking the loss. Luis Alberto did all he could at the plate to prevent that from happening though, going 1-for-3 with a double, a walk, and two runs scored. DePastino says that while he'd like to pair the brothers more often, he has to play certain players at certain times. "You can't do it all the time," he said, "because certain things are in order but it was great to have that experience." Matt Lindner is a freelance writer for Sports Media Exchange, a national freelance writing network.